Akkarai S Subhalakshmi, Indian classical (Carnatic) violinist and vocalist, took the music world by storm at the tender age of eight, and her music continues to touch the hearts of countless music lovers around the world. Subhalakshmi hails from a musical family; her grandfather Suchindram Shri S P Sivasubramaniam was a multifaceted musician renowned as a violinist, vocalist, and composer; and her grandmother Smt R Sornambal was a Harikatha exponent. Subhalakshmi is the disciple of her father, Akkarai Shri S Swamynathan, a veteran violinist who founded the Swara Raga Sudha school of music. Under his intensive training, she began her career in both vocal and violin by the age of eight, stunning audiences with a skill and maturity belying her years. She was soon joined on stage by her younger sister, Akkarai S Sornalatha, known together as ‘Akkarai Sisters’, today holding the unique distinction of being highly sought-after as both violinists and vocalists worldwide. Subhalakshmi also trained under Shri V Janakiraman, Shri O V Subramanian, and his daughter Smt Padma Natesan in New Delhi, and later on, Padmabhushan Shri P S Narayanaswamy and chitravina maestro Shri N Ravikiran. 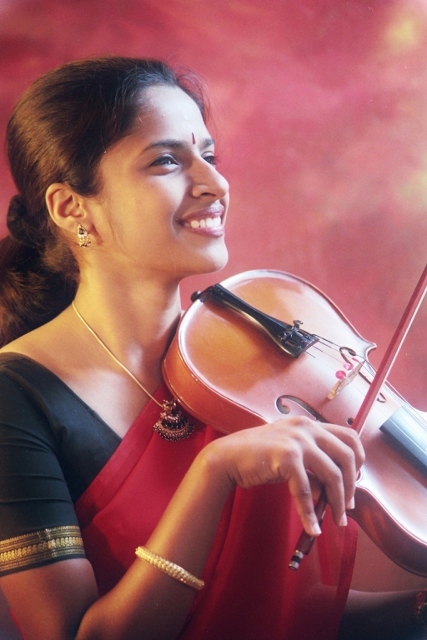 Subhalakshmi is one of today’s leading violinists, and is known for her unique tone reminiscent of the human voice, and her soulful music that is a harmonious blend of virtuosity on the violin and the fine nuances of Indian classical music. She is equally enthralling as a vocalist with her mellifluous voice and depth of creativity and sensitivity. She has played with legends like Dr M Balamuralikrishna, T V Gopalakrishnan, Chitravina N Ravikiran, Dr N Ramani, and R K Srikanthan, and has won great acclaim for her natural ability to adapt to any style and enhance and enliven the music. Subhalakshmi has performed widely in India, and abroad in Japan, Singapore, North America, Europe, the Middle East, Australia, New Zealand, Sri Lanka, South Korea, Israel, and so on. Her international debut was in Moscow at the age of thirteen for the Indo-Russian cultural exchange programme. She has been featured at the Théâtre de la Ville Festival (Paris), the farewell concert for Zubin Mehta (Munich), the Darbar Festival and Sadler’s Wells Theatre (U.K.), a special duet with her sister for the Emperor and Empress of Japan and the Chief Minister and Governor of Tamil Nadu, and so on. She has also given talks and lecture-demonstrations on Carnatic music, the art of accompaniment, and so on, for various prestigious institutions around the world. Subhalakshmi was conferred the Rajiv Gandhi Yuva Puraskar award by the President of India at the age of thirteen, and has since earned a host of awards, including the Yuva Kala Bharathi (2002), the Kalki Krishnamurthy Memorial Award (2007), the Ustad Bismillah Khan Yuva Puraskar award from the Sangeet Natak Akademy (2007), Vani Kala Nipuna (2012), and the Shanmukha Sangeeta Shiromani (awarded to the sisters together in 2009). In 2019, she became the youngest violinist to achieve the A-Top Grade at All India Radio and Doordarshan. She had been proclaimed one of India’s 50 emerging stars by The Week magazine’s issue commemorating the Indian nation’s 50th anniversary. Subhalakshmi’s first album was a rare feat featuring her vocal with her own violin accompaniment at the age of fifteen. Her other albums include ‘Keeravani’ and ‘Varali’, and duets with her sister such as ‘Double Bow’, ‘Ananda Tandavam’, ‘Inta Saukhyam’, and Charsur’s ‘December Season’ 2012 & 2013. A highly-sought after teacher, she has benefited many students around the world with her deep knowledge of music. She attributes all her success to her gurus, especially her father Akkarai Shri S Swamynathan, who established her as a musician and continues to guide her.